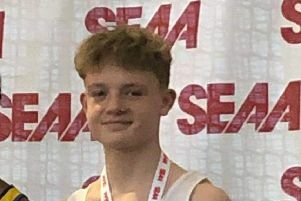 And the prodigiously talented 16 year-old came home a winner in 56:96 and absolutely smashed the English Schools qualifying standard in the process. Kong then set a long jump personal best (PB) of 6.13m on Sunday during the Peterborough Open meeting. William Hughes was among the best performers winning the 100m in 10.9, while Elizabeth Moorhouse’s winning throw in the shot of 11.95m easily met the English Schools standard. Under 15 Kai Chilvers ran a speedy 2.11 in the 800m to finish second. Under 13 girls Evie Hemmings (2:42.86), Eliza Mardon (2:40.37), Matilda Halford (2:43.23) and Lola Fletcher (2:36.88) all ran good 800m races. Isla Fullock Holmes impressed with a 5:27.50 in the 1500m, Evie Blow won the Under 20 300m in 46.6 and Katie Marsh clocked 13.90 for first place in the Under 13 75m hurdles. Dylan Tomaselli and Archie Rainbow both dominated their age group in the 1500m with Rainbow running 4:21. 49 in the Under 20 age group. Under 17 Tomaselli ran 4:37.27 knocking nearly 20 seconds off his previous fastest time. Mike Chapman felt mixed emotions after a frustrating Manchester Marathon on Sunday. The Nene Valley Harriers distance runner had set his heart on running his first sub three-hour marathon, but ended up an agonisingly close seven seconds off with a 3:00.06 clocking. Passing through the half-marathon mark in 1:27.02, the endurance running coach looked well set to achieve his goal, but slowed markedly in the last few miles. He did, however, have the consolation of running a new PB as he finished in 61st position. His previous fastest time was 3:00.33 run in 2015, and it’s surely only a matter of time until the 39 year-old dips under the three-hour mark. Two other Harriers were bidding for sub three-hour clockings, and both felt they ran well despite falling just short. Lee Harthill clocked 3:05.24 for 925th place while Andy Todd finished 1,231st in 3:08.44. Yaxley’s Sharron Toms had a tremendous run recording a new PB of 3:33.50 and clubmate Sophie Seddon clocked 3:37.46 in her first marathon. A trio from Helpston Harriers ran in the Lincoln 10k on Sunday with John Herbert first over the line in 25th place in 33:55. Jim Morris was 45th in 35:53 with Michael Moore 15 places further back in 36:33. Werrington Jogger Jack Green was 47th in 35:39. Laura Grimer of Nene Valley Harriers was the second lady home in the Sandy 10 in 1:07.48. Ramsey Road Runner Simon Mead placed 11th in 59:14 with Steve Lomax from Yaxley 15th in 59:42. Bushfield veteran Paul Baxter ran a speedy 1:07.01 to take 33rd place.